Short on time and long on the urge to become a certified diver? The PADI Scuba Diver certification might just be for you… Particularly if you expect to go scuba diving primarily in the company of a dive guide or if you have limited time to devote to scuba certification, consider becoming a PADI Scuba Diver. The certification is recognized worldwide and is valid for life, to a maximum depth of 12 meters / 40 feet. 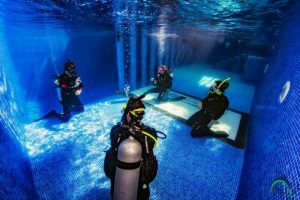 The Scuba Diver certification opens the door on the underwater world for anyone who’s thought that a course would take too long or be too difficult. During the course, you’ll make three pool dives and two dives in the ocean under the supervision of your PADI Instructor. Be at least 10 years old for Junior Scuba Diver course and at least 15 years old for the Scuba Diver course. PADI eLearning requires a minimum age of 13 years due to international internet laws. Show that you can tread water for ten minutes and swim 200 m in our pool. PADI offers a variety of home-study materials for the Open Water Diver course. While eLearning is the most convenient option, you may also chose a book and logbook package. At the dive shop, you can purchase the PADI Open Water Diver Manual or the Open Water Crew-Pak. The Crew-Pak includes the Open Water Diver Manual, the Recreational Dive Planner (RDP) and a logbook. Choose the most convenient program for you diving adventures among our different options. The PADI Scuba Diver is an entry level scuba diving course designed to take you to the certification. If you have already done your Discover Scuba Diving in the last 6 months with us, select the option upgrade below. Note: Student divers must have a personal set of PADI Materials for use during the course, as per PADI standards. Take the world’s most popular scuba course and become part of the adventurous diving lifestyle. Your swimsuit, towel, and the liability and medical release forms.